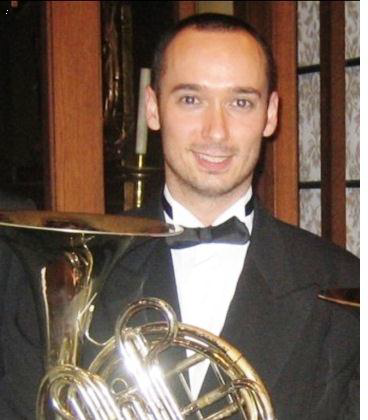 Lee Travers started learning the French horn, with Mike Magee, when he was 5. He studied with Jeff Bryant before and through Trinity College of Music, and with Roger Montgomery on natural horn. He took a sabbatical year after graduation in 2002. Unfortunately he forgot to end it for 4 years. In the meantime Lee retrained as an Accountant and has enjoyed a far less colourful career working in financial audit. Since 2007 however, he has enjoyed playing for the love of the instrument and the music that he plays. In 2011 he started playing with the Brentwood Philharmonic and Havering Concert orchestras, as well as with a number of other orchestras and in musicals throughout the East of England region. Lee is treasurer of the Brentwood Horn Club, and says that his enjoyment of playing the instrument has really been boosted by his camaraderie with Dean and the other horn players in the area. He has also recently become treasurer of the British Horn Society. Lee has voiced his enjoyment for the Haydn double horn concerto, and is thoroughly looking forward to this afternoon’s performance.